Take the time to enjoy a deep breath this weekend when the 405 freeway closes for Carmageddon II. If it's anything like last year, the air quality is about to get amazing. In study findings announced Sept. 28, UCLA researchers report that they measured air pollutants during last year's Carmageddon (July 15–17) and found that when 10 miles of the 405 closed, air quality near the shuttered portion improved within minutes, reaching levels 83 percent better than on comparable weekends. Because traffic dipped all over Southern California that weekend, air quality also improved 75 percent in parts of West Los Angeles and Santa Monica and an average of 25 percent regionally — from Ventura to Yucaipa, and Long Beach to Santa Clarita. 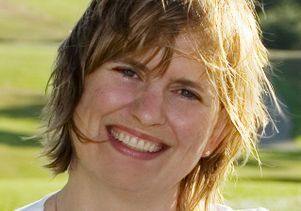 The study was led by two professors at UCLA's Institute of the Environment and Sustainability: Yifang Zhu, who is also an associate professor of environmental health sciences at the UCLA Fielding School of Public Health, and Suzanne Paulson, who is also a professor of atmospheric and oceanic sciences. While the researchers expected cleaner air, they didn't expect the improvement to be so dramatic. "The air was amazingly clean that weekend," Paulson said. "Our measurements in Santa Monica were almost below what our instruments could detect, and the regional effect was significant. It was a really eye-opening glimpse of what the future could be like if we can move away from combustion engines." The research gives a peek at what the air would look like in a healthier Los Angeles with a vast majority of hybrid and electric vehicles and shows how quickly less driving can improve key measures of air quality. But to get a regional effect, the researchers said, you need a regional drop in traffic, like what Los Angeles saw during the first Carmageddon — and it doesn't last if traffic returns. "The effect was gone by the next week," Paulson said. "We measured fresh emissions: pollutants that come directly from cars. It's a very short-term effect." The researchers measured ultrafine particles (less than 0.1 microns in diameter), which are key indicators of real-time traffic levels, and also fine particulate matter known as "PM2.5" (less than 2.5 microns in diameter), which includes tailpipe emissions and new particles created when the emissions interact with the atmosphere. PM2.5 can spread farther from the freeway and last longer than ultrafine particles, but both are pollutants with health risks. Exposure to near-roadway pollutants has been linked to increases in asthma, heart attacks, strokes, diabetes, low birth weight, pre-term births and other ailments, the researchers noted. Zhu and Paulson found that when traffic dropped more than 90 percent on the closed 405, with only construction vehicles still on the move, ultrafine particles dropped by 83 percent. PM2.5 concentrations dropped 36 percent. More broadly, ultrafine particles and PM2.5 levels dropped 75 percent across a swath of West Los Angeles near the I-405/I-10 interchange stretching from Santa Monica to Westwood. Elsewhere, they measured PM2.5 and found the air 31 percent cleaner in Ventura, 19 percent cleaner in Yucaipa, 30 percent cleaner in Long Beach, 23.2 percent cleaner in Santa Clarita and 19.9 percent cleaner in Northridge. "There is no safe level of PM2.5 concentrations, where you would no longer observe health impacts, so any reduction is an improvement," Zhu said. "This study shows that with such dramatic traffic reductions, there are specific air-quality improvements. It gives policymakers and the public incentives to put more effort into reducing traffic emissions." Zhu's team set up instruments 50 meters upwind and downwind of the 405 near UCLA, where Constitution Avenue crosses the freeway, and measured pollutant levels for 12 hours each Friday, Saturday and Sunday the weekend before, during and after the first Carmageddon. Zhu used a condensation particle counter and a scanning mobility particle sizer to measure ultrafine particles, a dusttrack to measure PM2.5 amounts, and a video of traffic on the 405 that allowed her team to count and compare traffic volumes. "People knew about the closure, so we started to see a traffic reduction early Friday, and our data showed a similar trend almost immediately," Zhu said. "Pollutant levels drop in real time." Paulson's team drove instruments around in their "mobile measurement platform" — a late-1990s electric Toyota Rav-4 equipped with a fast mobility particle sizer to detect ultrafine particle levels and a dusttrack to measure PM2.5 concentrations. The team has used the same route since 2008 and can compare measurements over the years, from Santa Monica's Sunset Park neighborhood to the Santa Monica Airport, and from north of the 10 freeway, across the 405, and into Rancho Park and Westwood. 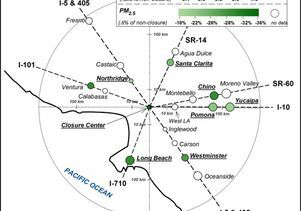 For measurements across the Southern California basin, Zhu and Paulson used South Coast Air Quality Management District measures of PM2.5 levels and CalTrans measures of traffic. Carmageddon II: To breathe, or not to breathe? Though the pair will not duplicate their research for Carmageddon II this weekend, if there's less traffic again, the basin will get a brief reprieve from pollution. "It has to be a significant, regional change, not just 10 miles of freeway closing," Paulson said. "It was really, really, really clean in Santa Monica, and I don't think that was due just to the 405, because the wind blows in from the ocean. I think it was due to people not driving around in Santa Monica." Indeed, traffic was measurably lower across the Southland, compared with a normal weekend: down 56 percent in Northridge, 21 percent in Ventura, 17 percent in Santa Clarita and Westminster, and 4 percent to 7 percent in Yucaipa, Long Beach, Pomona and Chino. In fact, without fancy instruments like the dusttrack or a fast mobility particle sizer, traffic may be the only way the average person will know whether air quality is better this weekend. 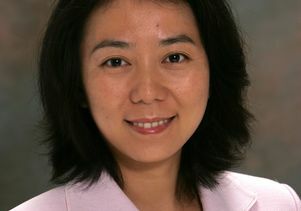 "These pollutants are too small to see," Zhu said. "The public will notice if there's less traffic, but they won't detect the particles in the air." It's not clear whether Los Angeles will get a repeat of last year's "Carmaheaven" traffic, but now we know to take advantage, Paulson said. "If it turns out there's very little traffic on the freeways," she said, "everyone should go out and experience what clean air can be like." The UCLA Institute of the Environment and Sustainability is an educational and research institute that unites disciplines: physical, life and social sciences; business and economics; public policy and urban planning; engineering and technology; and medicine and public health. IoES includes multiple cross-disciplinary research centers, and its environmental science undergraduate degree program is one of the fastest growing majors at UCLA. IoES advises businesses and policymakers on sustainability and the environment and informs and encourages community discussion about critical environmental issues.